By buying this product you can collect up to 157 loyalty points. Your cart will total 157 loyalty points that can be converted into a voucher of 7,85 €. 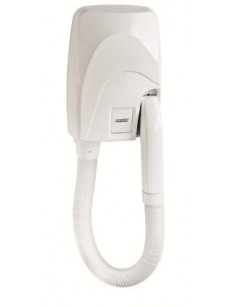 Exclusive bathroom wall mounting hair dryer with a functional, robust and trendy design that blends into any space perfectly such as hotels, hospitals and elderly care centers. This powerful and long-lasting hair dryer is activated automatically when hand piece is removed from the main body and has a total power of 1,100W. Multi-functional: the device can be used for drying hands, body and hair. Silence and quick-drying. The hair dryer works efficiently thanks to a high speed and a powerful air flow, all of this with a low noise level and saving time and money. Three air speed settings simply moving the speed selector.